I so hate this time of year. April Fool’s Day is a minefield for international news, where time zones painfully elongate the period in which improbable news stories may or may not be true, leaving me needing to treble-check sources and then I’m still juggling the odds I’ve fallen for some prank news story. So when this story appeared on the Bangladesh news circuit on Monday, April 2, I have to admit my first thought was to dismiss it as an April Fool’s prank, given April 1 fell on a Sunday this year. But since then several reputable Bangladesh news sources have covered the story, so it would seem to be genuine. Penguin Random House India is asking authors in a neighbouring country, Bangladesh, to write in English. Now for some context and a look at why just maybe this isn’t as outlandishly neo-colonialist as it at first sounds. It was literally just a month ago that the month-long Amar Ekushey Boi Mela ended in Dhaka, and now they’re at it again, with another month-long book festival in the Bangladesh capital. Only this time it’s all about English-language books. The festival began Sunday at the Pathak Shamabesh Centre in the city’s Shahbagh area, reports the Daily Sun (among others that include United Bangladesh News and The Independent), and it’s part of an exercise to encourage authors to write in English rather than the local language Bangla (Bengali) or the many other languages used across the country. And while of course PRH stands to gain financially from additional sales of English-language books, there is another motive behind this festival, as the Director General of Bangla Academy, Shamsuzzaman Khan, explained. Put simply, readers worldwide are being deprived from experiencing the delights of Bangladeshi literature because so little is translated into global languages such as English. That’s fair comment. Bangladesh has a rich literary history in both English and local languages, but even Bangladeshi literature written in English rarely reaches the outside world. PRH might want to address that problem before encouraging even more authors to write in their second language. PRH might also want to ponder how far its objective is in keeping with the statement of the Bangladeshi Prime Minister Sheikh Hasina at the opening of the Amar Ekushey Boi Mela, as reported here at TNPS back in February. We want our art, literature and culture to spread not only throughout the country but also the entire world. If we can’t respect and enrich our own culture, language, art and literature, we can never develop ourselves as a nation in the global arena. There are many talented writers in Bangladesh. If they start writing in English, they can reach their literature to the world. Which bit of “If we can’t respect and enrich our own culture, language, art and literature...” does Bishal not understand? One would think the world’s largest trade publisher would simply offer to pay for translations, into both English and other global languages, and recover the costs from future sales. But it seems PRH India wants the best of both worlds. so the interest of PRH India is understandable. 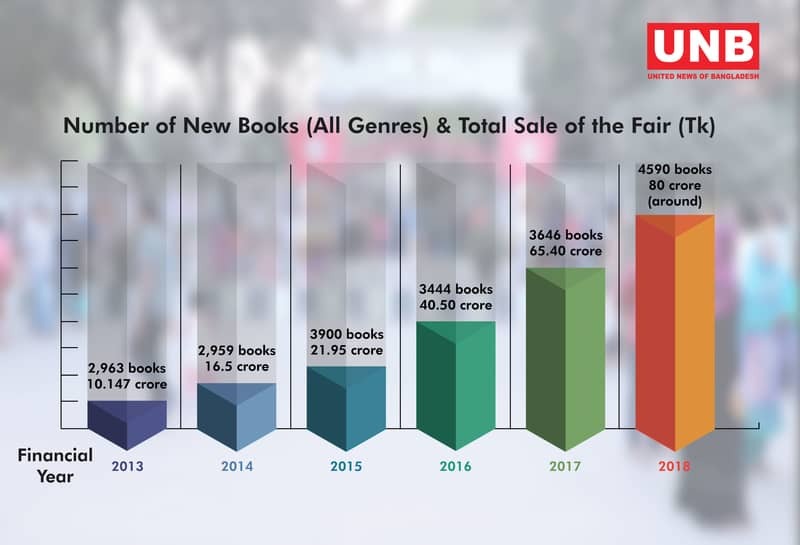 Bangladesh is an exciting and fast-growing market, as this graphic on the boi mela sales shows. And as further reported here at TNPS, the mega book sale event Big Bad Wolf is heading for Bangladesh this year too. But PRH India needs to look forward, not backward. Bangladesh may be dwarfed by its giant neighbour, but with a population of 166 million the country is no micro-market. And with some 80 million people using the internet Bangladesh is not just the tenth largest country by internet users, but has more internet users than any European country except Russia. Rather than asking Bangladeshi authors to write in English to reach foreign markets, perhaps PRH should look at helping Bangladesh authors reach their own people more efficiently in their own languages, by helping them develop ebooks that those 80 million Bangladeshi internet users could be downloading.